The Volume Weighted Average Price (VWAP) tells us the average price for all transaction executed during a trading session, such as the current day, week, month or quarter. 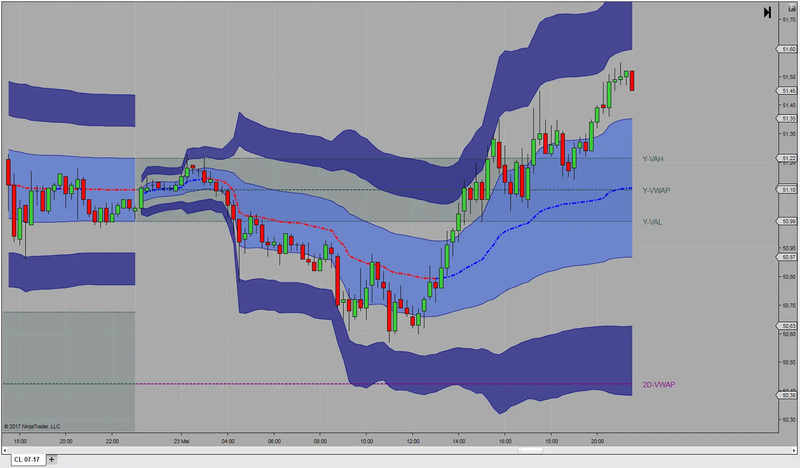 The Premium VWAP version can be compared to the Library VWAP version here. You may register for FREE trial anytime. Many institutional traders have their trade execution measured by the VWAP and it is therefore an important price benchmark to control transaction costs. The daily, weekly, monthly and N-monthly VWAPs are moving averages, anchored at the beginning of each period. All VWAPs are displayed with standard deviation bands calculated as a volume-weighted standard deviation from all trade data. The bands can also be displayed using a residual standard deviation-, residual mean absolute standard deviation, or the quartered range calculation. In the event that volume data is unavailable (or unreliable), you may choose the range-weighted average price (RWAP) as a substitute for the VWAP. The RWAP indicators have exactly the same properties as the VWAP indicator, however, the weighting is not based on volume data but the squared ranges of the price bars. RWAPs work particularly well for FOREX instruments. Accordingly, the Premium Session VWAPs contains a total of 8 different indicators including 4 VWAPs and 4 RWAPs. A series of Rolling VWAPs will be added to the Premium Session VWAPs in the near future. Aside from the current selected period, all indicators allow for display of the average price and the value area for the prior day, week or month. The value area is typically tested during the current period, unless there is a runaway trend. Furthermore all indicators allow for displaying several average price levels from prior periods. For example, you may display VWAP or RWAP for the prior 3 weeks, then compare them to the VWAP/RWAP of the current week and thereby define the trend. Finally, the Premium Session VWAPs applies a multiple time series function to improve accuracy when used on higher timeframe charts.. Specifically, a secondary bar series makes continuous calculations for bars that otherwise only would calculate on at the close of the higher timeframe bar series. For futures contracts that are traded on CME, CBOT, EUREX, ICE or NYMEX, the indicators allow to calculate correct VWAPs for extended trading days and take into account current holiday schedules.